Cambridge half marathon a fortnight away, walking along the cam and those evil Tories again. A cold, sunny Sunday in Cambridge yesterday. Plenty of eights on the river powered by the gilded youth, loads of runners and cyclists to knock you flying, hordes of couples mooning around (St. Valentine’s Day) and shoals of tourists shimmying from one photogenic setting to another (it can be such uphill work getting people to believe you’ve actually visited somewhere unless you are able to show evidence of yourself in a snap with relevant backdrop). I’m a creature of habit when I go into Cambridge. I always go into WH Smith to look at the magazines and usually buy one or two, I often go into Heffers bookshop or Waterstones, walk around the market square and visit the second hand book stall and take photos on a particular bridge over the Cam. Out of preference, I like to have a nice coffee and a tuna and cucumber baguette in the marvelously anonymous Eat cafe and possibly wander around John Lewis, a rather civilised department store. I like to trip through the extensive cosmetics area in a vain attempt to identify any of the sales operatives who have abstained from caking themselves in their own products. They are always immaculately turned out and attractive but wearing no or minimal makeup doesn’t appear to be an option. Are they contractually obliged to over do it? These grand and beautiful trees are on Jesus Green. How lucky are we? Cambridge half marathon is only two weeks away. I haven’t done the training I would like to do because other things have got in the way. Nevertheless, it’s good to know that despite not having put the mileage in, my overall level of fitness enables me to step up quickly to do 13 miles. It’s speed that suffers, of course, but if speed is your objective you are following a false god! The very shallowness of the concept of speed! Does anyone really care about this over valued aspect of running? I rather like these fall back arguments when you’re getting slower and slower. Anyway, I did 13 miles today and 9 miles a week ago plus a 5 miler and a parkrun since the beginning of the month. I might do two more parkruns and a couple of long runs up to 10 miles and that will be that. A government task force has published a report, A Five Year Forward View for Mental Health, which is very critical of the state of Engand’s mental health services, click here to read Observer article Today’s Guardian headline is NHS vows to transform mental health services with extra £1bn a year. The report talks about a sharp increase in the number of suicides, estimates three quarters of people with a psychiatric condition do not receive help and documents that children are being sent all over the country to an available bed that may be hundreds of miles from their families. The Tories and the coalition government have presided over savage cuts to bed availability, support services, staffing levels and overall funding of mental health facilities. Cameron in his ever so reasonable, we have learnt lessons, we must all pull together and defeat stigma, senior Tory style is presenting the spending announcement as an innovation and Tory triumph. David Cameron and his mates are duplicitous, fraudulent, own class supporting, unfeeling, and lacking in basic humanity. They appeal to the voters who share their values – the cruel, the selfish, the self centred. May God help decent and vulnerable people. I should have been running the St.Neots half marathon today but my lingering, three week old cold and no training scuppered it. I did do Cambridge parkrun yesterday, and last week, plus I ran a 10k race two weeks ago but these were more than manageable given my level of running fitness. I haven’t been out with the club for three weeks and there have been no training runs. So a bit of running but not much. Before my heart attack five years ago, I definitely would have run the half marathon today despite the cold and insufficient raining. In fact, I wouldn’t have given it much thought. Now, I give it a lot of thought. It’s great to be running at the same level as before the heart attack (despite the baleful effects the bloody cardiac medication has on my running). I describe it as baleful only in the sense that it restricts my speed and effort. I have to accept that overall it probably has a positive effect on my heart health (see how I have to qualify the (possible) benefit I am receiving?. Am I not incorrigible in this respect? Do I not have a shipping container stuffed full of caveats?) Recent research suggests that placebos have a very good health benefit (among many others, see Mind Over Medicine:Scientific Proof That You Can Heal Yourself by Lissa Rankin). I’m rehearsing a conversation with my GP. Me:Pretty please, Doc, take me off my heart medication and prescribe placebos instead! GP: I fail to see the rationale behind this idiotic request. Me: The current prescription is slowing down my running which won’t be the case with placebos. GP: You want me to take you off meds which strengthen and regulate your heart so you can run faster? Me: You’ve got it Doc! Current research points to a measurable benefit in a given condition even if the person is fully aware that they are taking an inert placebo. I believe a placebo would be very good for my heart health. You gotta believe as well, Doc. Together we can do it. I’ll keep you fully informed of my parkrun times. GP: Request denied with knobs on. Next patient, please! Note to family : only joking! I’ll go for a leisurely, longer run this afternoon. It’s chilly but not cold, will probably be raining, will definitely be dank, dark and overcast but I’ll just take it on the chin. I wore trail shoes for yesterday’s parkrun. Unlike last week when a number of people fell and injuries included a broken ankle, I didn’t hear of anyone coming to grief. I wasn’t far off my old times so I mustn’t complain. I was thinking about placebos as I went around. See how beneficial they can be! I picked up the above books in the Emmaus (homeless charity) store which, conveniently, is less than a mile from me. The Rare Words book is good to dip in to, if you like words. It means you are a logophile (not a lover of wood fires). Not much, if anything, on etymology, though. Of course, If you are a Sun, Star or Mirror reader I don’t think you need a vocabulary greater than 500 words so don’t bother (gratuitous insult of the day). Grumpiness! Very much under rated, very much maligned. Far better to call it discernment or sagaciousness. It should be recognised as an art form and as an academic subject. Should this be offered, one might be able to do a Phd in Grumpiness. It would certainly appeal to people over a certain age. This ailing walnut tree continues to fascinate me. Despite its appearance, it soldiers on and had a good canopy of leaves this year. I listened to the excellent The Life Scientific (BBC Radio 4 this week , available as a podcast on iTunes) and heard Professor Dave Goulson talk about preserving bumble bees in the UK. He set up the Bumblebee Conservation Trust and has done a lot of work on the reasons for the decline in bee populations. Very interesting and positive. I think one of the focuses of my therapeutic gardening project will be on creating a bee, butterfly and bird friendly environment. Must pull my finger out! Two random pictures. 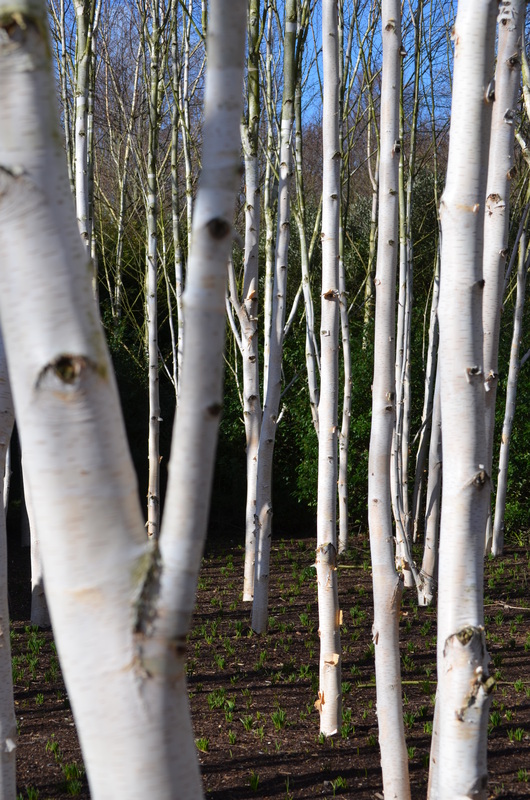 These trees are silver birch (betula jacquemontii) which have ghostly white, smooth bark. 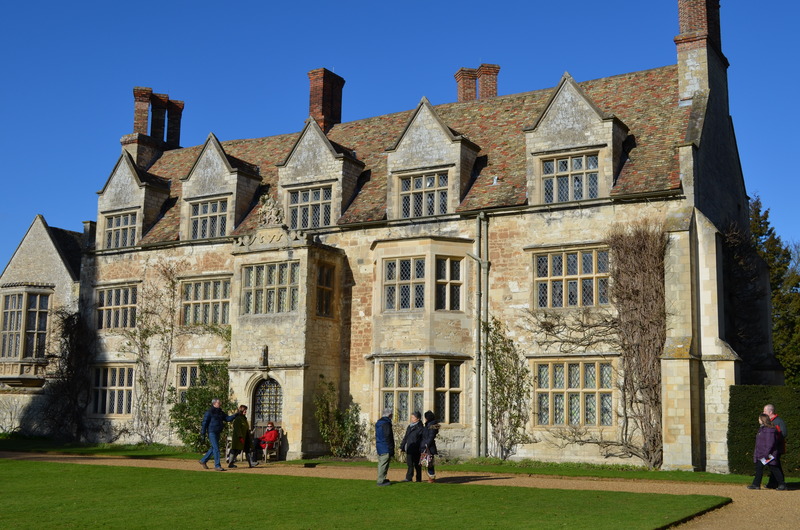 There is a beautiful group of them in the Anglesey Abbey gardens, Cambridgeshire. On the right is the main house in the grounds. Two weeks to go before Cambridge Half Marathon! Last Sunday I ran 13.2 miles and today I ran the same course around 3 minutes faster. No sunshine today and I reckon that accounts for about 4 minutes extra plus it was very windy which adds on another 3 minutes. Several runners did not respond to my greeting which dismayed me and resulted in a temporary slower pace while I recovered emotionally; add on 2 minutes. Finally, the river Cam anglers, notorious for their complete disinterest in anything other than catching ridiculously small fish and hoisting them out of the murky waters, kissing them and then depositing them back into the water, were all dressed in dull, drab, dark, dismal jackets and heavy duty trousers. This also resulted in a brief lowering of spirits and accounted for a further 2 minutes. So, if better conditions prevail, I could run it 11 minutes faster on the day! I certainly felt more tired today compared with last Sunday. This is probably because I am still recovering from last week’s run. According to Lorna, I should now “taper” my runs until race day. My response is tapery wapery or bish,bash,bosh. I may defy running convention and run 20 miles mid week and 25 miles next weekend. But I may not. One of the reasons for not doing further long runs, apart from being deliberately idiotic, is because I tend to lose too much weight. When I returned today, I weighed 9 stone 5 lbs which is on the light side for me. I have a good appetite but I can still lose weight easily and look thin and gaunt; more like a moving match stick rather than a young Clint Eastwood.